Are you searching for the best possible Hostgator hosting promo codes? Well you’ve found the top spot for the latest discounts and promotional offers available today. I have been a loyal customer of Hostgator for many years now and rate their hosting services highly. One of my first sites that I ever built is still sitting on a Hostgator server, 10 years on! Disclaimer: The links on this page are affiliate links. This means that we get a small commission should you buy hosting from Hostgator. This helps us to keep Makeawebsitehub running and 100% free to use. This does not effect the price you pay in any way. In fact it’ll probably make it cheaper for you. The process of using a Hostgator coupon code is really simple! 1. Copy one of the codes below. 2. Paste it into the “coupon code” box on the Hostgator checkout screen. 3. Get a great deal on your hosting from Hostgator and you’re golden!!! Note that there are some links on this page that will apply a coupon code automatically. Yes!! If you know how to copy and paste, you are about to save some serious cash on your web hosting costs. Below you’ll see what the coupon section looks like. How to Use HostGator Coupon Code? All you have to do is follow the instructions below to properly redeem the HostGator coupon code, so you can get maximum discount on HostGator. First off you must click this HostGator link to visit their website. Click the “Start Your Site Now” button to get started. Next, enter your desired domain name. This will be your website’s address on the web (i.e. makeawebsitehub.com). If you need help choosing a name for your website one, check out our list of the best domain name generators. 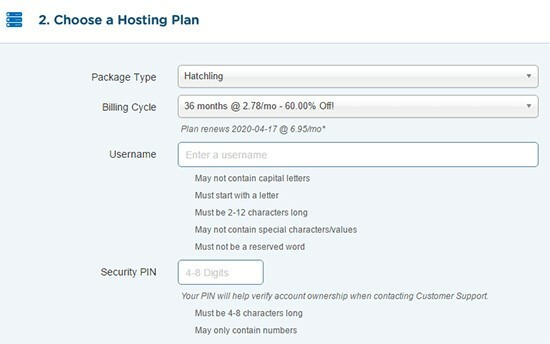 Below that, you can choose your hosting plan (Hatchling, Baby, or Business) and your billing cycle (1, 3, 6, 12, 24, or 36 months). You’ll also have to create a username for your Hostgator account, and choose a 4-8 digit PIN number for security. Towards the bottom of the page, you can verify that the relevant Hostgator coupon code has been entered. It should already be automatically applied since you clicked the link from our site. If not you can enter it again here. That’s all. Go ahead and click “Checkout Now” at the bottom to complete your purchase. We hope you found our HostGator coupon code to be helpful. Please check out our other exclusive coupons and deals here. SO, IS HOSTGATOR GOOD ENOUGH? Unlike a lot of its competition Hostgator, true to its name, focuses on providing hosting solutions and that’s about it. A lot of modern low cost hosting solutions attempt to offer a little bit of everything. They try and offer hosting and a fully functional domain purchasing system, they try and offer shopping carts and advanced e-commerce solutions while simultaneously trying to offer online business advising, SEO and other marketing solutions. Often these other companies fail due to their far-reaching ambition. They fail because they try and offer everything and end up offering nothing of real value. It doesn’t matter if a web hosting company also offers a fully integrated shopping cart solution for an up charge if you can subscribe to a superior third party solution for less money. If you read my Hostgator Hosting Review you will see I find Hostgator is far superior to a lot of other web hosting products or you can read my comparisons of Hostgator to Godaddy, Bluehost and Dreamhost. WHAT, EXACTLY, WILL YOU GET FROM HOSTGATOR’S WEB HOSTING PLANS? Hatchling Plan – 1 domain and unmetered bandwidth – Hatching plan is ideal for new bloggers who want to set up a simple site and blog to a small audience. For the average person a baby web hosting plan with Hostgator will provide them with absolutely everything they need to get online and build a website they’ve always wanted. If you want to run a WordPress site, then Hostgator is one of the best web hosts around and one that’ll help you get the most out of your site. If you’re just planning on running a small site then you can probably get away with using a standard shared hosting plan. But, when your WordPress site starts to grow you’ll want a hosting package that’ll fully support your site’s growth while improving things like site performance and security. Starter plan: Prices start from $5.59 per month and is great for WordPress sites that get up to 25,000 visitors per month. Starter plan coupon automatically applied with this link. Standard plan: For the standard plan prices start from $7.95 per month and supports WordPress sites that generate traffic up to 200k visitors per month. Standard plan coupon automatically applied with this link. Business plan: The final WordPress hosting plan is the Business Plan. This plan is great if you’re operating three entirely different WordPress websites. Plus, you’ll have support for traffic levels up to 300k monthly visitors. Price start from $9.95 per month. Business plan coupon automatically applied with this link. Note: The longer the term you pay for, the cheaper it gets. The prices listed above are for a 36 month contract, payable in full up front. VPS hosting is an awesome hosting option for people who’ve outgrown shared hosting but aren’t quite ready to upgrade to a dedicated server just yet. It supports higher traffic levels at a smaller cost to dedicated servers. The reason VPS hosting can do this is by utilizing server virtualization technology to create a dedicated server environment, while still keeping costs low. Hostgator has 3 VPS hosting options, all with a discount coupon which you can automatically apply using this link. Do Hostgator offer a money back guarantee? Yes, Hostgator offer a generous 45 Day no questions asked money back guarantee. If you have any issues in those first 45 Days Hostgator will refund you the full amount. Do Hostgator offer discounts for annual billing? Hostgator has some great discounted deals available to people who buy hosting 12, 24 or 36 months in advance. How can I pay for my Hostgator account?